I’m pleased to report that we're making progress on all fronts. We have started the second phase of our capital campaign, initiated an international architectural design competition, formed new partnerships with the DC Public Library and OMNI Reboot, and have two public events planned for July. With your continued support, we can achieve these objectives by the end of the year and open the preview museum on schedule. The preview museum is the first major step on our path to offering meaningful educational and cultural opportunities for adults and children alike. Please help us connect with other museum supporters by sending this update to interested friends, family, and colleagues. You can also help by making a tax-deductible donation to our capital campaign and asking your employer to match it. The links in this newsletter will lead you to more information on our plans and progress. We are excited to build a home for science fiction and an institution that supports learning, innovation, and imagination. PS: The above image is of Lewis Groswald, Chairman of the Programs Subcommittee, who went Back to the Future at the photostation during the June 14 event. The Museum of Science Fiction launched the second phase of its fundraising efforts, a campaign focused on major donors, during an exclusive event on June 14 at the Virginia home of science fiction art and rare book collectors Howard and Jane Frank. Featuring the likes of C-3PO, R2-D2, Boba Fett, and other costumed representatives of the 501st Legion, the event brought together more than 100 people to celebrate the museum’s numerous accomplishments to date and discuss the path forward. Among those in attendance were fellow art collectors, leaders of governmental and private enterprises, and local resident John Morton, the actor who portrayed Luke Skywalker’s gunner Dak Ralter in Star Wars: The Empire Strikes Back. Executive Director Greg Viggiano thanked the crowd for embracing the museum’s concept, noting how ongoing support from donors and business partners such as the DC Public Library, Science Channel, and OMNI Reboot demonstrates the need for a project of international scope centered in Washington, DC. Additionally, he said the solid relationships the museum maintains with other institutions, including the Smithsonian and the EMP Museum in Seattle, demonstrates how eager the industry is to include a destination focused on science fiction. Guests contributed to an ongoing museum video project exploring the definition of science fiction and departed with souvenir chocolates custom-made to resemble Flash Gordon’s rocket ship, plus a copy of Great Fantasy Art Themes from the Frank Collection, a 128-page volume showcasing Jane and Howard Frank's strong interest in genre artwork. THANK YOU to everyone currently supporting the museum’s capital campaign. The cocktail reception at Jane and Howard Frank’s home marked the Pioneer Fund’s official kick off. The museum’s senior staff celebrated science fiction with generous people who share the museum’s vision for creating a center of gravity for the genre. Share your passion for science fiction with your friends and colleagues. Make a list of people who you believe would like to support the museum and send them the link to the 2013 Prospectus and 2014 Addendum, or send your list to Cal Coolidge, and we’ll reach out to them with this information. Be sure to “LIKE” the museum on Facebook, follow us on Twitter, and share and retweet the museum’s posts. Make a donation to the museum right now, or even better, sign up for a monthly recurring donation. Thank you again for supporting the Museum of Science Fiction! The current architectural design competition is exceeding all expectations. So far, 134 people from 56 countries have registered to submit concept designs for the preview museum. The competition is accelerating progress on design work and getting the international community involved. A public exhibit and popular vote are being planned at the DC Public Library in September. Registration will close on July 25, 2014. Submissions are due for judging on August 31, 2014. The winner will be announced on September 15, 2014. On June 27, the museum signed a partnership agreement with the DC Public Library heavily focused on increasing literacy and project-based learning activities. Programming will begin in September with a perfect book on the Library's 2014 summer reading list: The Time Machine by HG Wells. A lecture about the book and screening of the 1960 George Pal film are being planned. A press release will be issued later this week. Other programming updates will follow via Facebook and Twitter. The museum announced a new partnership with OMNI Reboot and will host an online exclusive gallery co-curated by OMNI. In joining forces, the museum and OMNI plan to grow the science-science fiction community while working together to promote science, technology, engineering, arts, and math (STEAM) education. Co-hosting events in the science-science fiction space is also being planned. Since its inception in 1978, OMNI has encouraged its readers to dream and wonder. Click to read the press release. The Museum of Science Fiction will host its First Annual Staff and Volunteer Picnic on the Potomac River at Gravelly Point under the northern approach path for Regan National Airport in Alexandria, VA, on Sunday, July 13, 2014, from 11:00 am to 4:00 pm. Bring your picnic baskets and blankets, and meet the museum family for an engaging time of fun, music, and games by the Potomac. Horseshoes, bocce, Frisbee, soccer, badminton, and trivia are sure to please, and the use of solar telescopes may also be available - courtesy of advisory board member, Alex Young, NASA Goddard Space Flight Center. Everyone is welcome. Feel free to bring friends, family, and even your dog! Plenty of parking available - come early. More information regarding the picnic will be distributed via Facebook and Twitter. Please take 5 minutes and provide your opinion on exhibit preferences for the preview museum. Click here to take the survey. Most of the earliest memories of science fiction were rooted in family, such as sharing a favorite television show or movie with their sibling or parents. This audience was well versed in many areas of the genre. They could identify and discuss films, television series, and literature on a variety of science fiction topics. Having an iconic object and being able to engage directly with it within the exhibit, not just seeing a model behind glass. For example, climb into a DeLorean, wave around a sonic screwdriver, or read a tricorder. Focusing on the relationship between science fiction and “real” science. Why have some science fiction technologies have been created (Google Glass) whereas some have not (flying cars)? Learning the artistry behind science fiction. Not just seeing it, but understanding how it came to be. What were the originators’ reasons, desires, and inspirations, for their creations? The survey data will help the museum's curatorial staff design more effective exhibits for the various visitor segments and reluctant visitors. Thank you to all those who participated in the original survey, and we look forward to your future input! The shared booth space with the Science Channel, was a great success and great fun. It was the first time for the museum to exhibit at a convention of this size, and people gave a very warm reception. All of the people were very excited about the prospect of having the museum in their backyard (the DC metro area), and it was wonderful to see their enthusiasm as they heard about current planning. The museum had 13 people working shifts, plus three photographers, five videographers, and the museum’s Director of Digital Communities, Josh Lynsen, tweeting live on-location. Also, there was a video loop playing on all of the large convention hall monitors that gave the museum great visibility. The museum sponsored, created, and moderated three discussion panels that were well-attended and enjoyed by the crowd. In addition to entering contests and finding out more about the museum, many people really loved the Portal gun and Photon Probe prototype displayed at the booth. 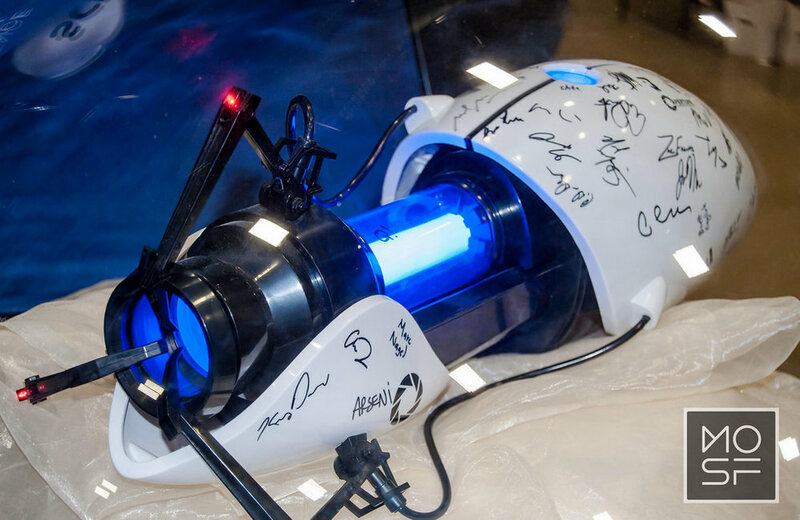 A replica of the "Aperture Science Handheld Portal Device" was on display at the MoSF/Science Channel booth. Can’t wait until Awesome Con 2015! Another museum project team is actively involved with developing a mobile app for the general public. The first three modules of the app include: a science fiction trivia game, an interface for interacting with wifi-enabled display objects, and a museum map. Several other modules are also being scoped for development. The trivia game currently includes over 900 questions (10% of the intended total database). Questions and answers are currently being researched and validated. The game design, graphics, and user interface are being tested and due to be released later this summer. In August, the museum’s senior staff will conduct a webcast for a special group of Indiegogo crowdfund donors. The webcast will include an interactive discussion and project update with ample time for questions and answers. An email invitation with web-conferencing instructions will be sent to special donors in mid-July. Indiegogo crowdfund donors that contributed $15 or more should have already received their digital “Founding Colonist” certificates and have their names listed on the “Founding Colonist” webpage: www.museumofsciencefiction.org/donors/. If you have not yet received your digital certificate, please contact Alex Carvalho at: info@museumofsciencefiction.org. 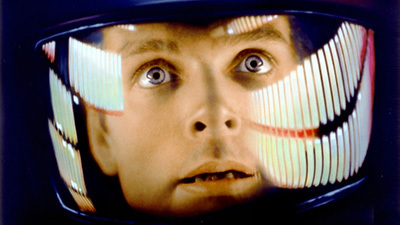 The groundbreaking 1968 film produced and directed by Stanley Kubrick still retains its allure and mystery. The NSO performs the score live as the enigmatic and compelling film is screened in the house and on the lawn. The film is presented by arrangement with Warner Bros., Southbank Centre London, and the British Film Institute. Click here for more information. MoSF lawn tickets are $22 each at the box office. Copyright © 2014 Museum of Science Fiction, All rights reserved.